I really hate the fact that my blog has been so neglected over the past few months. I'm not going to promise any over night miracles, where I blog every single day, and I finish projects every week etc etc... all I'll promise is that I'll try to get it all back on track. My depression has been getting worse since June, and now it is very bad indeed, so I've lost interest in absolutely everything. Knitting? meh.... Blogging? certainly not. Spending time with my friends? hmm if I have to. And I hate that I feel that way. Just this spring I was so excited about casting on new projects, finishing and gifting projects, and writing all my escapades down on this blog so you could share my joy and excitement. I want that feeling back, so I thought if I sink my teeth into blogging again, perhaps the constant writing about knitting will get me excited about the craft again. So, today I am going to tell you all about a pair of lacy mittens. Ooooooooh! My friend, Gene (Genevieve - such a beautiful name! ), has been such a lovely friend to me over the past year. So, to say thank you, I am making her a little parcel of goodies. In that parcel is going to be a pair of mittens, as not only is the cold weather on its way, but she also suffers with quite severe arthritis so keeping her hands warm is very important! 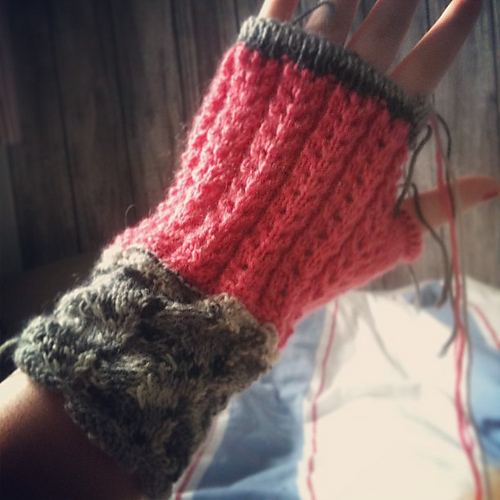 I found a pattern called Della Mitts by Holly Terrell, which is a really cute mitten with a variety of stitches. If I tell you the honest truth, I was originally making these for my friend Sarah, for the Hand Warming Swap I am hosting over on the Ravelry group Wish Upon a Star, but I then decided perhaps they weren't for her, and continued them for my friend Gene. I'm using two yarns: Life 4ply by Stylecraft in Melon, and Sirdar Town & Country 4ply Sock Yarn. The former is leftovers from the Delicate socks and Horseshoe Lace Cowl projects I made last year, and the latter yarn is a very small skein that my Nan gifted me from her stash. I thought these two yarns complemented each other well, and gave this pattern a bit of a 'twist'. Until tomorrow, dear friends. Until then, why don't you check out some wonderful posts by the rest of the WIP Wednesday gang? I promise you won't regret it!! I know what you mean about depression. I've been feeling it lately, too. I hope things clear up for you soon! Sorry to hear that you have been struggling so much. I've been there too so I know how hard it is. Just remember that depression lies and you can rise above this. (Even if it doesn't feel much like that right now). Big Hugs.